In 1967 the French army requested a new infantry weapon to replace both the MAS 49/56 rifle and MAT-49 submachine gun. Three years later, the French military standardized on the new 5.56-by-45-millimeter cartridge. With requirement and cartridge in hand, Paul Tellie, Manufacture d’Armes de Saint-Étienne — MAS — began developing a new rifle. MAS settled on a bullpup design featuring a lever-delayed blow-back action that removed the need for a gas system and theoretically made for a simpler, more reliable weapon. MAS built the first prototypes, designated MAS A1, in 1971. 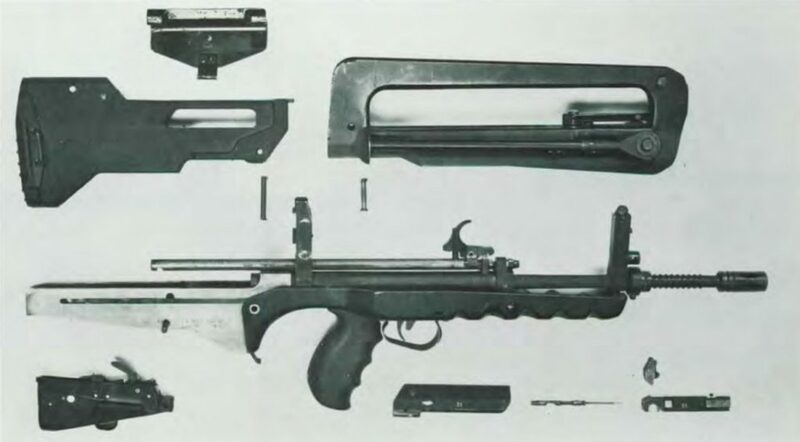 A series of development prototypes followed until the French government halted the program in 1974 in order to test foreign rifles including the HK 33 and the FN CAL. Meanwhile, the MAS A4 prototypes struggled with reliability issues, compelling MAS to put the weapon’s development on hold. The foreign rifles also failed to meet the French army’s requirements, however. In the summer of 1975, MAS resumed work on its bullpup rifle. The A5 and A6 versions focused on improving reliability and barrel-life. In 1977, the French army tested the A7 prototype. The MAS bullpup lacked a reliable three-round burst capability, so the army obligingly dropped the requirement. In August 1977, the French army formally adopted the MAS A7 as the Fusil d’Assaut de la Manufacture d’Armes de Saint-Étienne 5.56 Modele F1, or FAMAS F1. By 1979, MAS had developed a reliable burst system and incorporated this into the F1. The FAMAS first saw action in 1983 in Chad during Operation Manta. The FAMAS has a steel alloy receiver inside a plastic-fiberglass shell. Its unusual lever-delayed blowback action borrows from designs by John Pedersen and Pál Király. The bolt isn’t conventionally locked during firing. Instead, it begins to move rearward and an H-shaped lever at the center of the bolt slows the bolt’s travel. This allows pressure in the chamber to drop to safe levels before the action opens enough to extract the spent case and load a fresh cartridge. The lever-delayed system has benefits and drawbacks. It allows for a relatively simple weapon. On the other hand, there’s a risk of ammunition cases bursting due to over-pressure. The F1 also takes a proprietary, 25-round magazine rather than NATO-standard magazines. The FAMAS can be set up for left-handed users. The charging handle, located on top of the receiver inside the carrying handle/sight mount, can be cycled from either side. The direction of ejection can also be changed, as the ejector can mount on either side of the bolt. The F1 features iron sights on its carrying handle. The FAMAS also has an integral bipod and the ability to fire the AC58 and APAV40 rifle grenades. The bayonet fits onto the top of the barrel so it doesn’t project beneath the rifle. In 1995 the French navy adopted the improved G2 variant of the FAMAS that can accept NATO magazines. It also has a larger trigger guard, a slightly different stock profile and 1/9 rather than 1/12 rifling. The FAMAS has seen action with French forces around the world. In all, MAS, and later GIAT, produced approximately 500,000 FAMAS rifles. 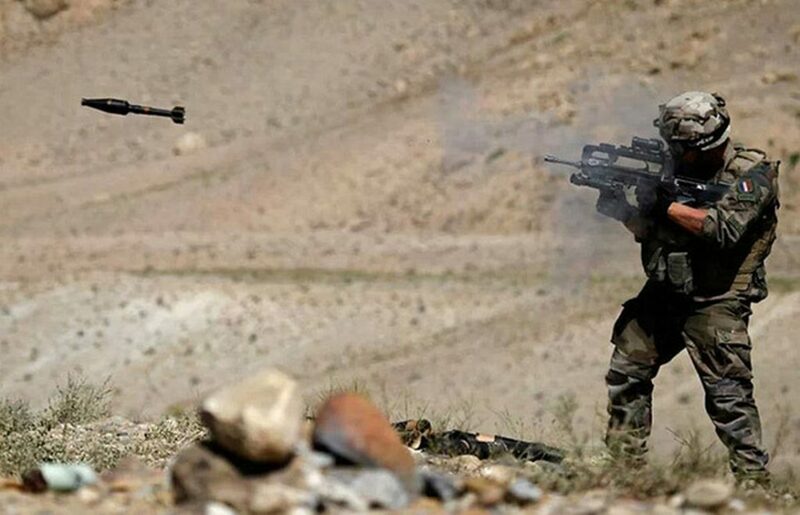 Over the years, the French military updated the rifle with optics rails on the carrying handle and, via the elaborate FELIN program, sensors and communications equipment. In 2016, the French government announced that the army would replace its F1s with the Heckler & Koch’s HK416F. But the initial order was for no more than 100,000 416Fs, meaning many of the roughly 400,000 FAMAS in French service will linger for years … or even decades.